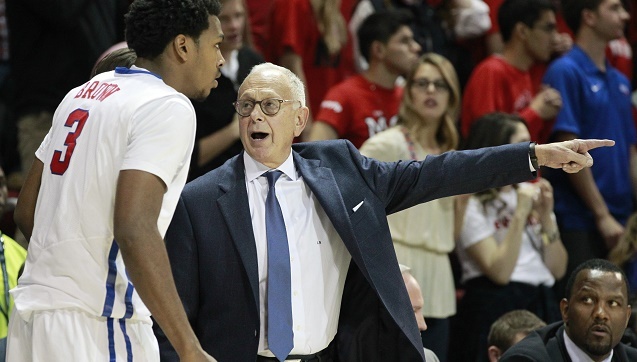 On Friday afternoon the SMU Mustangs found out they would be without their starting guard Nick Frazier who was suspended for being academically ineligible. Knowing that the team had a choice; feel bad or push through — the Mustangs chose the latter and got a full team effort in the 77-54 victory over the East Carolina Pirates on Saturday afternoon in front of another sell-out crowd at Moody Coliseum. Without Frazier — one of the team’s best perimeter shooters — someone else had to step up and that someone was sophomore guard Sterling Brown. Known more for his defense and rebounding ability, Brown had only scored double figures one time on the year but against the Pirates, the younger brother of NBA star Shannon Brown, had his best game of the season as he grabbed seven rebounds to go along with 10 points — including two three-pointers. Because of the interior scoring options that Yanick Moreira and Markus Kennedy presented, ECU wanted the Mustangs to prove they could shoot well from outside without one of their best shooters. The plan worked early on as the front court quartet of Ben Moore, Yanick Moreira, Markus Kennedy and Cannen Cunningham was held to only one made field and eight points in the first half. But the other part of the plan — hoping that SMU struggled from outside — backfired as SMU made 5-of-11 three pointers. In addition to the three three-pointers made in the first 20 minutes of the game, Nic Moore finished with 14 points and six assists. In the second half it appeared as if ECU head coach Jeff Lebo switched the defensive focus back to the perimeter and while the team remained in the 2-3 zone he extended it, which made it more difficult for the outside shooters, but created openings on the inside — which SMU took advantage of. After scoring only 10 points in the paint in the first half, SMU exploded with 28 in the second half. Leading the way with eight points on 4-of-4 shooting in the second half was sophomore forward Ben Moore. Moore finished the game with 11 points and seemed more assertive in his shot selection and the ability to make baskets in the latter part of the game. The one bright spot for the Pirates was the performance from junior guard Terry Whisnant. The Florida State transfer tied a career high as he scored 24 points and made 6-of-11 three-pointers. Joining him in scoring double figures was guard Caleb White, who finished with 14 on 5-of-12 shooting to go along with five assist.